Passages to the Past: Guest Post by Kathryn Harrison & Giveaway of Enchantments! 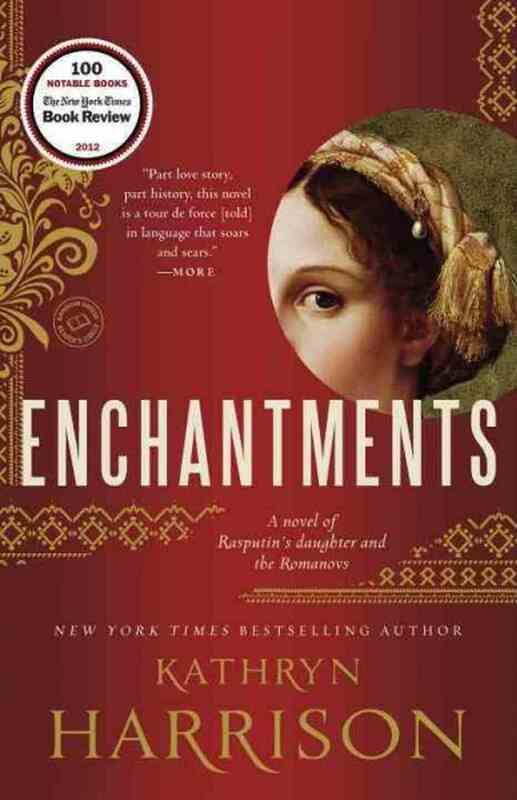 Guest Post by Kathryn Harrison & Giveaway of Enchantments! Passages to the Past is pleased to be hosting Kathryn Harrison today as part of her virtual book tour with TLC Book Tours with a guest post and giveaway of her novel, Enchantments! You can read my review of this wonderful novel here. My interest in Revolutionary Russia was ignited by Robert K. Massie’s Nicholas and Alexandra. I was no older than 12 when I read it, an eager consumer of vampire stories, accounts of Catholic martyrdoms, novels with consumptive heroines coughing blood. A car accident when I was 5 had left me fascinated by blood, permanently under the spell of its power. Flowing from a wound I didn’t yet feel, it summoned rescue, snapping me into a bright circle of blinding and terrifying attention. As soon as I understood that Prince Alexei, the sole heir to the Russian empire, was a hemophiliac who might, a hundred years ago, have died as the result of something so little as a nosebleed or a bump on the knee, I was hooked. Massie is a novelistic biographer; he stays so close to his subjects that history - in this case, the rise of the Bolsheviks - is revealed from the inside out. My adventures in Russia didn’t begin with sweeping social changes or ideologies or chronologies or precipitating events or any of what would come to represent my academic relationship to history. In fact, I protected the idea of Russia as I grew up - not on purpose, but I avoided taking classes in Russian history and consciously allowed the land to become wholly a realm of the imagination, undisturbed by professors or cramming for tests or any of what might deaden a topic. Undisturbed by travel, too, as I’d never been there. Instead, I had literature, magic stories like Gogol’s “The Overcoat” or Bulgakov’s The Master and Margarita; narratives with twisted fever logic like Dostoyevsky’s Crime and Punishment. Anna Karenina. And all the White Russians - Nina Berberova, Nabokov, Pasternak. In preparation for writing the novel I did my homework, just as diligently as I did when in high school. I checked my dates and facts, but not to serve them. I was writing fiction, looking for which events and people would serve my ends as a novelist. Long after I’d discovered Grigory Rasputin, he’d continued to trouble me - so mysterious and sinister. I read a few books about him and discovered that his elder daughter had escaped Russia and eventually became a successful lion-tamer - who toured the United States as the “Daughter of the Mad Monk Whose Feats in Europe Astonished the World” - I was instantly riveted. How could it be that Rasputin had been a family man, of all things, with a wife and children of his own? It made me reconsider his role in history. And the fact of his having a daughter who knew the Romanov family, and who had been made the tsar’s ward upon her father’s assassination, gave me a means of entering the Romanov’s world, seeing it through the eyes of an unconventional young woman who loved a father whose flaws she accepted, and who had her own vantage from which to view the Romanovs and the Revolution. Though Masha couldn’t fulfill the tsarina’s hope that the daughter of Rasputin could do as her father had done and protect Alexei from injury, she could provide him the solace of her company. She’s a story-teller, one who can find magic and romance in the least likely of places, and so she can transform the prince’s bleak vision of the world crumbling around him. Their time together is short—only a few months—but her gift for story-telling transports the two of them to an imagined realm of endless possibility, a world in which they live out the fairytale endings the real world cannot promise. In many ways that’s what Enchantments is about - the power of stories to transport a listener, or a reader, to another realm of consciousness. That they open the door between conscious and unconscious. Which I suppose is what art is about, all of it. St. Petersburg, 1917. After Rasputin’s body is pulled from the icy waters of the Neva River, his eighteen-year-old daughter, Masha, is sent to live at the imperial palace with Tsar Nikolay and his family. Desperately hoping that Masha has inherited Rasputin’s healing powers, Tsarina Alexandra asks her to tend to her son, the headstrong prince Alyosha, who suffers from hemophilia. Soon after Masha arrives at the palace, the tsar is forced to abdicate, and the Bolsheviks place the royal family under house arrest. As Russia descends into civil war, Masha and Alyosha find solace in each other’s company. To escape the confinement of the palace, and to distract the prince from the pain she cannot heal, Masha tells him stories—some embellished and others entirely imagined—about Nikolay and Alexandra’s courtship, Rasputin’s exploits, and their wild and wonderful country, now on the brink of an irrevocable transformation. In the worlds of their imagination, the weak become strong, legend becomes fact, and a future that will never come to pass feels close at hand. 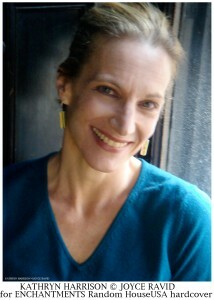 Kathryn Harrison was born in 1961 in Los Angeles, California, where she was raised by her mother's parents. She is a graduate of Stanford University and the Iowa Writers Workshop, where, in 1986, she met her husband, the novelist Colin Harrison. They had a first date on Friday, April 25, and on Monday, April 28, they moved in together. The Harrisons married in 1988, and live in Brooklyn with their three children. Kathryn writes novels, memoirs, personal essays, biography, and true crime. She is a frequent reviewer for the New York Times Book Review, and teaches memoir at Hunter College's MFA program in Creative Writing, in New York City. Kathryn Harrison is currently on tour with TLC Book Tours, please see the schedule of stops here. 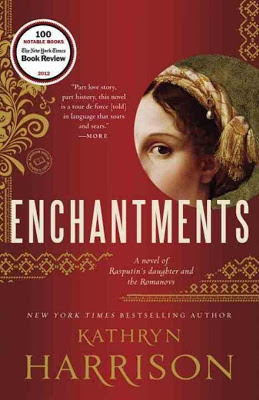 Stop by tomorrow for a guest post by Kathryn Harrison and a giveaway of Enchantments! Passages to the Past has one paperback copy of Enchantments up for grabs! To enter the giveaway, please complete the RaffleCopter giveaway form below. Giveaway is open to US and Canada residents only. Ends on March 10th. Thanks for featuring Kathyrn's post for the book tour! Great post on Kathryn Harrison. I've been a huge fan of hers since her debut, THICKER THAN WATER. Thanks!